The SNUG project provides residential retreats for families caring for a child with a rare health condition. The whole family attends the retreat together and a program of activities is designed so that EVERY attendee can participate. All accommodation, meals and activities are provided. If you care for a child with a rare condition, or you work with a family who might be interested in these special retreats, please submit an expression of interest. SNUG is coordinated through the Family Action Centre at The University of Newcastle and is assisted by the Steve Waugh Foundation. Aim to create a relaxed environment for families to build on their strengths, improve resilience, and develop friendships and support networks with others who are experiencing similar challenges. Focus on identifying and celebrating the skills and strengths of ALL family members – parents, children with special needs, and their siblings. Provide a wide range of activities over 5 days which are designed so that all can participate – including music therapy, art therapy, physical activity and outdoor recreation, craft, sensory play, and parent discussion. Are supported by a team of trained volunteers. Educate, train and support our volunteers (mainly undergraduate students of the University of Newcastle) in understanding the unique issues faced by families with children with special needs through our volunteer program. Are held at least 4 times every year at Myuna Bay Sport and Recreation Centre, NSW. Are the only retreats of this kind in Australia. Experiencing difficulty accessing complementary health resources and services (e.g. music therapy). Referral Process: Families can apply directly by filling out the SNUG Program Family Expression of Interest form (PDF, 189KB). Alternatively, a health care or other service provider can refer a family (with their consent) by completing the form on their behalf. Eligible families will then be contacted and placed on a waiting list until the next retreat is available. Cost: SNUG provides all meals, accommodation, and activities. Cost to the families includes travel from their home to Myuna Bay Sport and Recreation Centre and return, and any travel that may be required during the retreat. Volunteers are essential to the operation of the SNUG program. Volunteers support the staff and families in many of the daily and recreational activities, and are vital in enhancing the supportive, strengths-based and fun atmosphere of the retreats. There are many opportunities for volunteers to share their skills with the families while also sharing some laughter and fun. Who volunteers: SNUG volunteers come from a variety of backgrounds and age groups. The majority of our volunteers are undergraduate students from the University of Newcastle, studying a range of disciplines including Education, Physiotherapy, Speech Pathology, Occupational Therapy, Social Work, Psychology, and Nursing. Selection process: Anyone can apply to become a SNUG volunteer by completing the SNUG Program Volunteer Expression of Interest form (PDF, 127KB). Volunteers must then attend a comprehensive training program. All volunteers undergo required Working with Children and Criminal Record checks. Volunteers are selected for their caring attitudes and ability to relate to others. Please read the SNUG Program Volunteer Position Description (PDF, 131KB) for more information. Benefits of volunteering: This is a unique opportunity for volunteers to gain knowledge and skills in working with children with special needs and their families. Volunteers are able to interact with the families in a relaxed environment, allowing a rare insight into their strengths, daily challenges and joys. Volunteers are provided with comprehensive training and ongoing support within a multi-disciplinary team. Past and current volunteers have spoken highly and passionately about their time with the SNUG program. In turn, SNUG staff, families and visiting professionals have frequently commented at the enthusiasm, energy and compassion our volunteers consistently display. Volunteering for SNUG: Within SNUG, 25 new volunteers have been trained over 2017-18 (so far), with more training later in 2018. These volunteers are all students at The University of Newcastle, from a range of disciplines including: Occupational Therapy, Speech Pathology, Psychology, Physiotherapy, Medicine, Social work and Arts/Law. Most volunteers train with us in their first or second year of university and stay with us until they graduate. We have 60 active volunteers on our database at present. The SNUG program is a unique opportunity for students to gain knowledge and skills in working with children with special needs and their families. Students are able to interact with the families in a relaxed environment, allowing a rare insight into their daily challenges and joys. Volunteers assist the children, who have a wide range of differing abilities, with activities such as outdoor recreation (canoeing, rock climbing, and obstacle courses), art, music, dance, and sensory play. The program is strengths-based, focused on what the children CAN do, ensuring everyone is able to participate in their own way. The volunteers are provided with comprehensive training and ongoing support, in a multi-disciplinary team of students and staff. Past and current volunteers have spoken highly and passionately about their time with the SNUG program. In turn, SNUG staff, families and visiting professionals have frequently commented at the high level of enthusiasm, energy and compassion our volunteers consistently display. 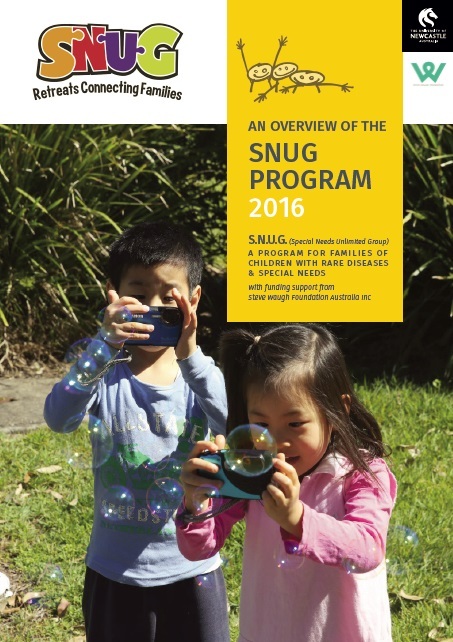 The SNUG Program was founded in 2006 by Dr Peter King, a specialist in Special Needs and Children’s Dentistry. The idea for the program was based on a highly successful residential program for children with disabilities called the Agrenska Program, which has been operating in Sweden since 1989. The Family Action Centre was approached to take on the coordination of what was to become the SNUG Program, as the idea fit well within the FAC’s ethos of strengthening family and community wellbeing. A Program Committee was then formed in May 2006 by a group of interested and concerned professionals working with families caring for children with special needs. 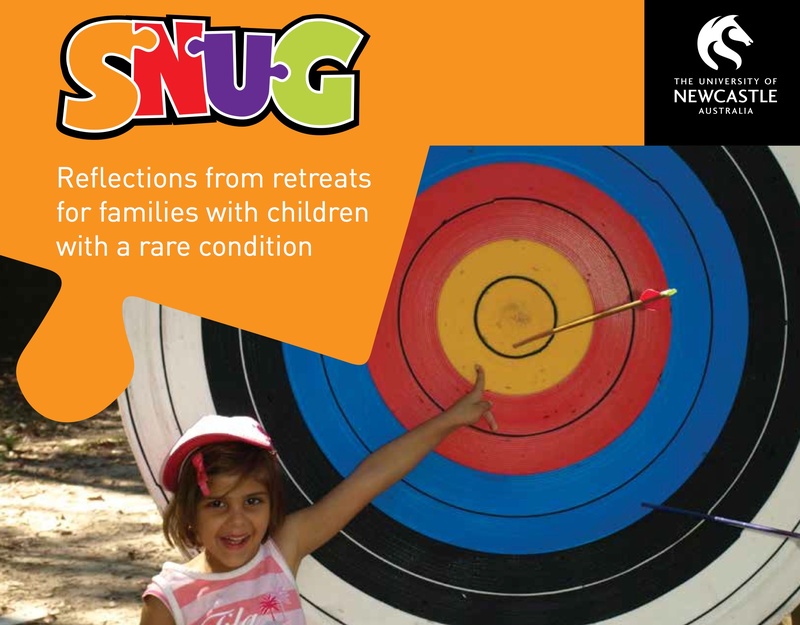 After developing a relationship with the Steve Waugh Foundation, which provides support to families caring for children with rare health conditions, the Family Action Centre was able to run the first SNUG retreat in 2009. Initially the SNUG Program was offered only to families living in rural areas of Australia, due to the difficulties involved in accessing medical, dental, allied health and complementary health services faced by these families, as well as the difficulty of accessing social support. 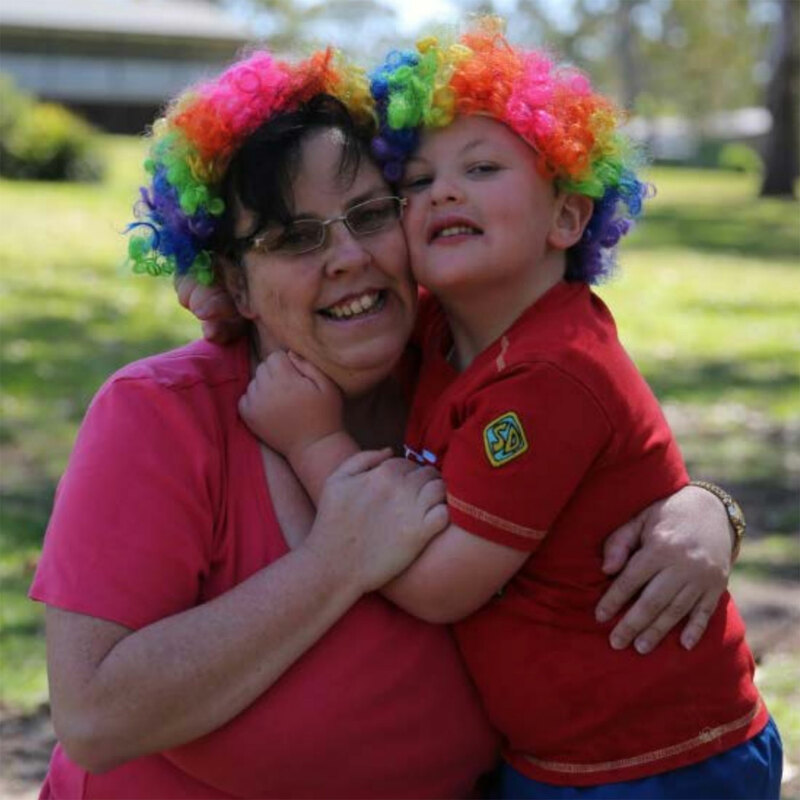 However, since then the SNUG Program has been able to widen its eligibility criteria to all families caring for a child with a rare health condition anywhere within Australia. Since its inception, the SNUG Program has supported over 100 families to access social support, strengthen their family bonds and resilience, and participate in a range of activities designed to identify and celebrate the skills and strengths of all family members. Feedback from families has been overwhelmingly positive and the demand for this service has been ever-increasing. In addition, through the volunteer program SNUG has provided invaluable opportunities to well over 200 undergraduate students to gain knowledge and skills in working with families and children with rare health conditions. The SNUG Program received an Honourable Mention at the 2011 Community-Campus Partnerships for Health (CCPH) Annual Award. This award recognises outstanding collaborations between universities and communities worldwide, which support and encourage community well-being. Listen to SNUG Founder Dr Peter King talk about the SNUG project and The Family Action Centre. This report is about 15 x SNUG retreats held between 2009 & 2012. 72 families attended. 115 student volunteers were involved.